Two of the custom scene’s most enigmatic personalities are Alessandro Fontanesi and Marco Filios. 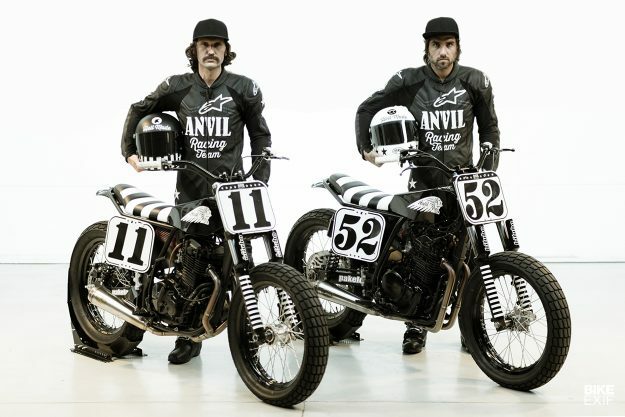 Known as ‘Phonz’ and ‘San Marco,’ they’re the creative force behind the Italian custom outfit Anvil Motociclette and the annual Wildays festival. 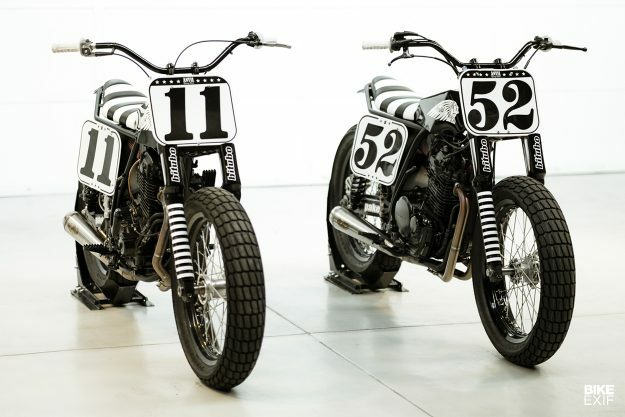 You’d be forgiven for thinking these two longhaired, heavily tattooed custom builders are brothers. Considering they’re the same age, went to high school together, and have been friends for twenty years, they may as well be. 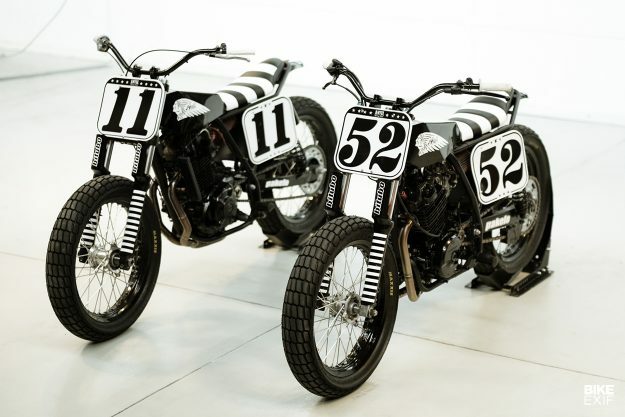 To celebrate the two decades of their friendship, they’ve started racing flat track together. 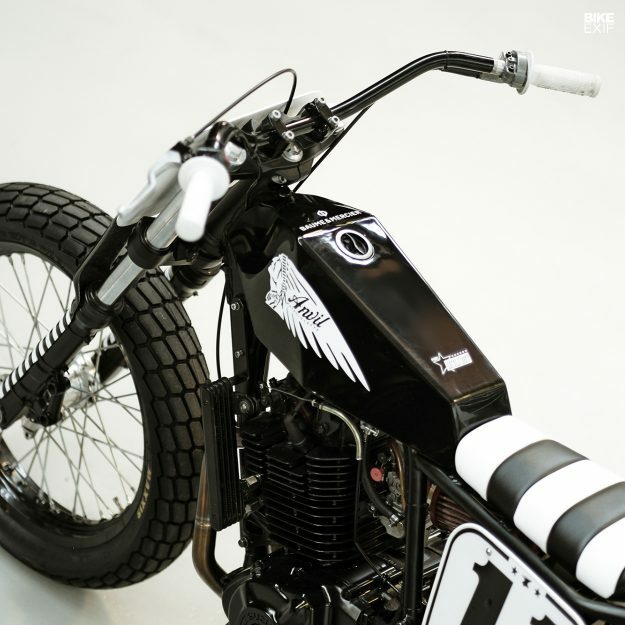 So when Indian Motorcycle commissioned the Scout ‘Shrimp’ tracker from Anvil, the boys built a set of matching race bikes for themselves too. Phonz’s bike is Little Boy (#11) and San Marco’s is Fat Man (#52). At a glance they look the same—but they’re actually very different. 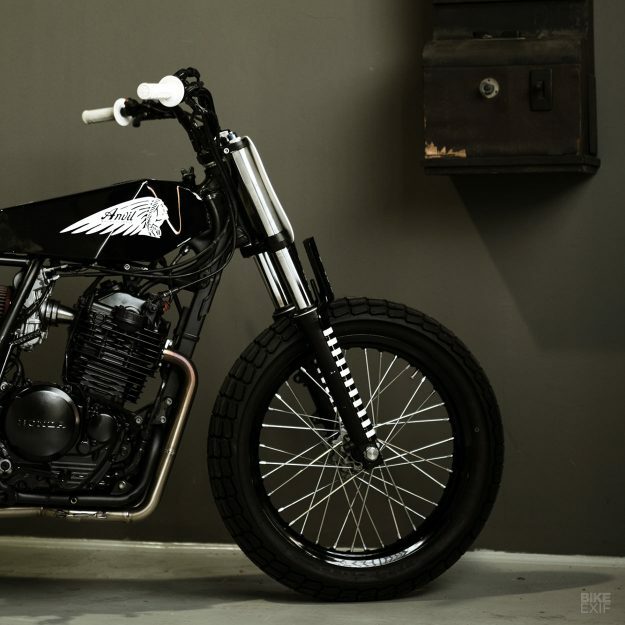 Little Boy has a Suzuki DR600 motor in a DR500 frame, and Fat Man is based on a Honda XR600. 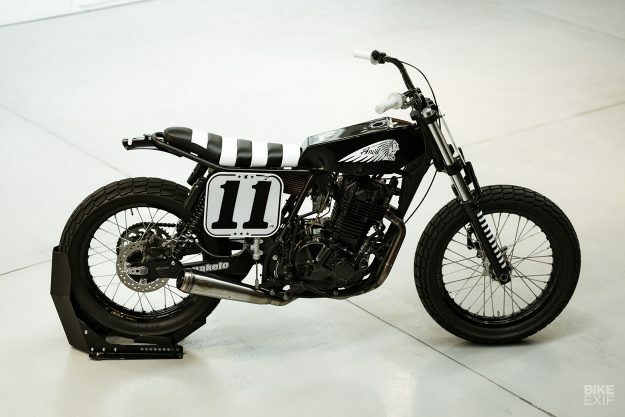 Fat Man (below) lives up to his name: Anvil started with a 1995 XR600 rolling chassis, and a 1991 XR600 motor. Then they bored the already stonking thumper out to 650 cc, and added a Keihin FCR 41 flatslide carb, with a BMC filter. The XR600 is sporting a new front end too, with a set of modified forks and triples from a Yamaha R6. For the wheels, the guys laced a set of 19” Excel rims to the original XR hubs. As is the norm in flat track racing, there’s no front brake—but the rear brake’s been refreshed with a new disc and pads from Newfren. 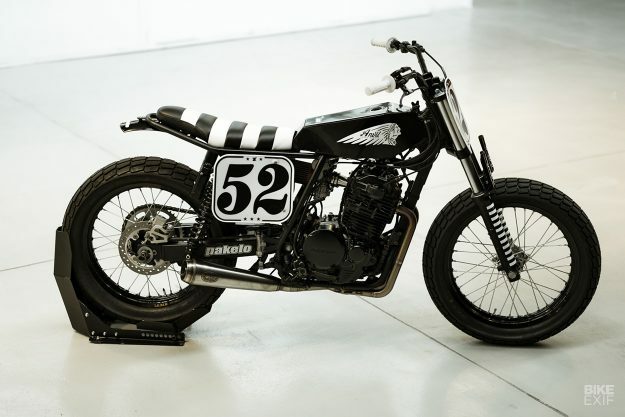 Little Boy’s donor bike is a bit of a mash-up too (below). Phonz wanted the compactness of the older Suzuki DR500’s chassis, but with a bigger motor. So the guys wedged a 1990 DR600 mill into a 1981 DR500 frame—which meant fabricating new engine mounts. With matching number boards and fork guards up front, and all-black paint on the engines, it’s hard to tell the two apart. But it’s the remaining mods that really make them indistinguishable. To achieve uniformity, Anvil built almost identical subframes for both bikes. 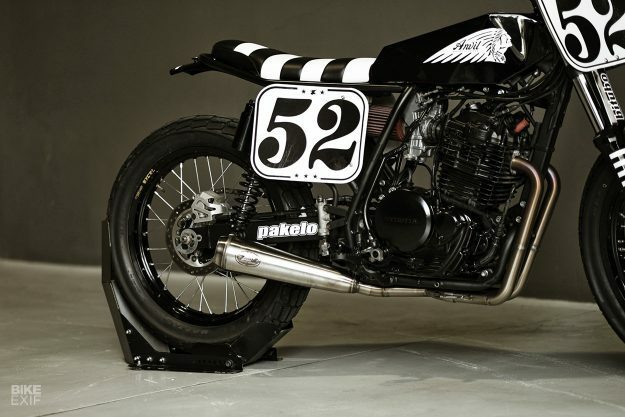 On the XR600, that meant converting the rear end from Honda’s trusty Pro-Link monoshock to a dual-shock system. Both rears were then fitted with new Bitubo shocks, and capped off with matching number boards, and aluminum rear fenders. For the seats, Anvil wanted to move away from the more common flat track tail sections, towards a style more reminiscent of the 60s. 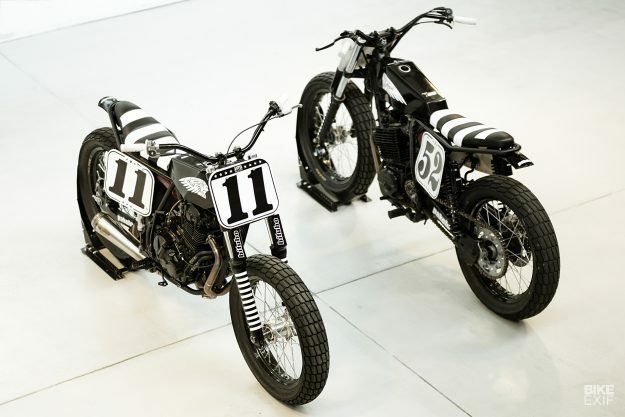 So they built a pair of matching saddles, upholstered in their signature black and white pattern. The Honda and Suzuki share the same fuel tank design too. Anvil fabricated matching aluminum shells, then designed each tunnel specific to each bike’s frame. The rest of the running gear is the same across both trackers: Ariete foot pegs and grips, and Tommaselli flat track bars with minimal controls. Both bikes have also had their wiring stripped right down to the bare essentials. 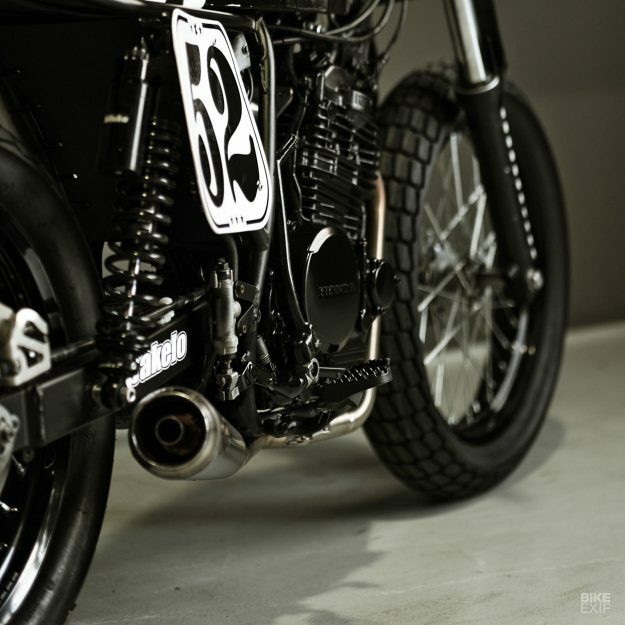 Then there’s those stunning exhaust systems. Anvil partnered up with Zard to design headers specific to each chassis, with both systems terminating in matching reverse cone mufflers. That said, San Marco’s already bagged two third-place finishes in his class, and Phonz has finished fourth overall for the season in his. Not bad going for a couple of rookies. Anvil would like to thank their partners: Ariete, Baume & Mercier, Bitubo, BMC Filter, Newfren, Pakelo, Zard and Rizoma.